Vintage two piece aluminum 9 inch angel food pan. 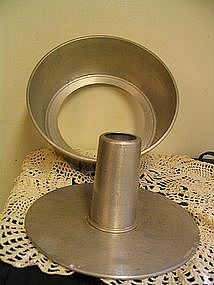 I know this is an angel food pan, but I always used these to make low heat pound cakes. They were absolutely wonderful baked in this pan because the cake would have a thick crust. If you sprinkled the cake with powdered sugar, while it was still hot, it almost created an icing. It has been used quite a bit, but no dents or dings and the insert is a good fit with no leaking. I need your zip code to calculate the postage.